Icy Phoenix already comes with Custom Profile Fields (ACP -> Users -> Add Custom Profile Fields), but what if you wanted to create a deeper, richer Custom Profile Field? This guide will help get you started down the right path. In this DOC, I will be explaining how to add a new Custom Profile Field for Xbox LIVE Gamercards. In this case, make sure the field is as seen in the picture: "xbox". We want to make the Xbox LIVE Gamercard viewable on viewtopic_body.tpl. Now we need to add the variable. 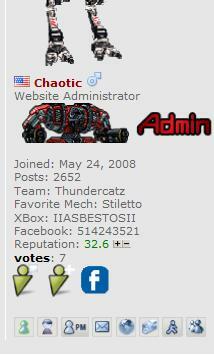 Now we need to make the Gamercard viewable on viewtopic. Now let's add the language variable for the Custom Profile Field. You are able to do anything with the Custom Profile Fields and this is just one of the many different things you can use it for. Thanks to Luca for guidance! Great Doc again Chaotic... number one in the docs department.. I just needed some explanacions of how to implement these thing´s . Like Facebook? Want to add a button to your posts that links users straight to your Facebook page so they can add you as a friend? Enter your ACP -> USERS -> Add Custom Profile Field. Just enter those two fields and click SUBMIT. In the above lines, ($lang['10_facebook']), please replace the number 10 with your custom profile field ID. To find your custom profile field ID, ACP -> Users -> Edit Custom Profile Fields. Look for your custom profile field and note the number to the left of the field you created. You should change the number in the above code to YOUR custom profile field ID. how i could put that? How i put the logo? Can you please ask your question in "General Support"
and can you please explain a little bit more your question, because I don't understand what you mean. Se puede poner algo como el id de play station osea algo asi¿?¿? This is great! Thanks! Ur one BIG help! Keep it up!